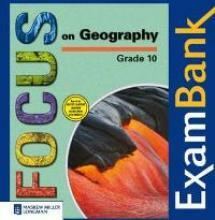 Focus on Geography Grade 10 ExamBank CD-ROM includes all the requirements of the January 2008 Learning Programme Guidelines and Subject Assessment Guidelines. The ExamBank CD-ROM helps you to set exams and tests quickly and easily. It contains a large database of questions, equivalent to between four and six full examinations and provides memoranda, compiled as you select the questions. All question and memorandum papers are compiled in Microsoft Word, so editing and printing is easy.